If your plumbing is connected to a well pump or the city water supply, then you can still flush if those two things are shut off. All you need to do is have a bucket of water handy. After flushing, refill the toilet tank with that water. It works the same as the usual flush just don’t refill the bowl. When you go on vacation the hope is that nothing will go wrong back at home. It helps to let your neighbors know you’ll be gone so they can keep an eye the place. But you can also take proactive measures to minimize the risk of potential damage. A big issue could be trouble with your plumbing. That’s why you should turn off your main water valve before going away. It’s a very simple fix and could save you major headaches upon your return. Most people who have a garage remote clip it to their visor for easy access. That might be setting yourself up for trouble from some unscrupulous characters. Anyone who breaks into your car can quickly check the registration for your home address and swipe the garage remote. That gives them instant access into your house. Look for remote that you can carry on your keychain or adapt your garage door opener to your smart phone apps. Your home needs to be insulated. That insulation is measured as an R-value. The higher the R-value the better you’ll be insulated. Even though insulation may to be the same thickness it is the density that matters. No matter how big your home is you’ll soon find that it fills a very quickly with a lot of clutter. There are plenty of things that you want to keep in storage that you used throughout the year. However, they could be just as much if not more items that you’re never going to use again. This is all the junk you’re holding onto for no good reason. It can all be carted away with one call to Junk King Sarasota. These are the junk removal professionals that can make a huge difference when it comes to clearing rubbish from your home. It doesn’t matter how heavy or bulky something is. 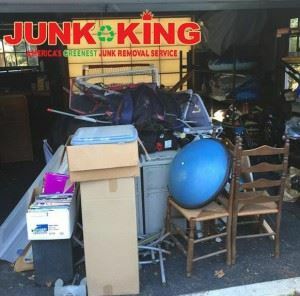 All that matters to Junk King Sarasota is that you want to get rid of it. Hire them to help today. This entry was posted in Sarasota Junk Removal and tagged homeowner, junk, junk removal on August 29, 2017 by Junk King. Last updated August 29, 2017 .